It was a busy week since Adobe decided to do a major update to their products including Lightroom and Photoshop. That kept me very busy since it seems to take forever for me to get it all working the same (still have a couple problems that aren’t working correctly). so I took a break from my normal blog and just decided to show what I worked on creatively this week! Chris Spooner made a short video called Create a Fantasy Map of Your Own Fictional World in Adobe Photoshop that really caught my attention. I had never thought of doing that! The more I worked on it, the more things I thought about adding. I named a few places after some my favorite people who create great work and some classical artists. It took forever to actually set the text, which I find really fussy with Photoshop anyway, and add a bunch of clip-art, mostly from PixelSquid, my favorite object site. Some of the images were from images I took and selected parts to add, like the resort hotel from Disney World. Chris Spooner also has a blog Download My Free Treasure Map Maker for Adobe Illustrator some basic map elements. I opened his Illustrator Treasure Map Assets.eps file, which opens up in PS. Created brushes from the objects by using the Lasso Tool and SHIFT+CTRL+J to put object on it own layer, then creating a brush by Turning on just the object layer and going to Edit -> Brushes. Not sure I used them on this map, but they looked like good, especially the pirate ships. The hardest thing about making this map was to keep the layers organized (contains 84 layers). Therefore group of layers were created for lots of the different elements so I could find them quickly, including text layers (31 text layers). There are water layers, road and trail layers, and each text and object had groupings. Many of the layers had Hue/Saturation or other types of adjustments layers (26 in total) attached to them to adjust out the colors. Most of the object and text layers have layer styles added to them. A Few Compositing Tips and Tricks! LEARNING TO DRAW A WOLF! This image of a wolf took me several days to complete! I am not exactly an expert with drawing, but I followed a rather lengthy tutorial by Aaron Blaise and it came out looking pretty good. (I actually had to start over as it looked wrong to me on my first attempt.) Of course, it is not as good as his, but considering I have very few skills here, it was really fun to create something I like! That is why I am passing this on in my blog – if I can do this, you can do this! Aaron Blaise is one of my very favorite illustrators and I have been following his blog for several years now. He worked for Disney Animation for a long time on many of their great movies (The Rescuers Down Under, Beauty and the Beast, Aladdin, The Lion King, Pocahontas, Mulan, and more). He has several videos on YouTube and many reasonably priced lessons on his website. 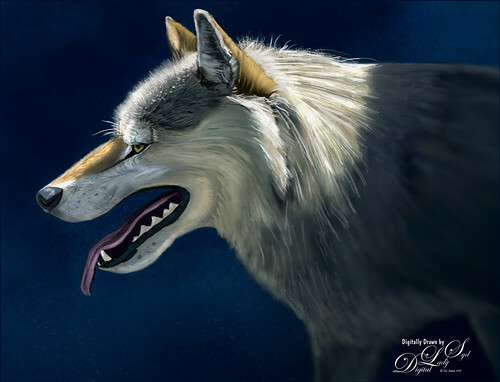 The Youtube video followed here was called How to Paint Fur-Photoshop-Wolf Portrait. What I really liked about the video is that he breaks the whole process down into several sections (and layers) so it is easy to understand how the image is actually going together. 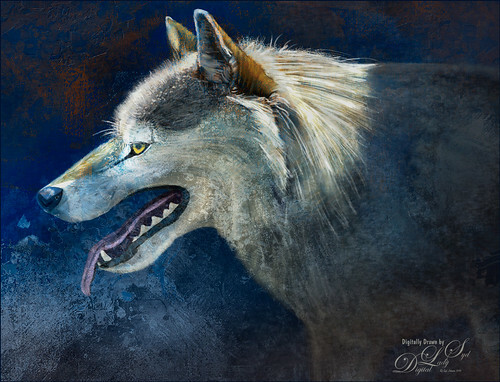 He starts off with teaching how to draw a rough sketch of the wolf, continues on with refining the drawing, adding color, then shadows and highlights, and finally adding the fur textures. I felt like I learned a whole lot and this is just from a YouTube. Below is what the drawing looked like after finishing up the tutorial, and it sort of looks likes his since I followed the steps pretty closely. In this case I would watch for a few minutes, then try to do what he was doing – this is a great way to learn how to do this. I liked how this image turned out too. There are lots of techniques Aaron shares on how to get the fur looking natural. One thing I did want to say is that you have to decide on a few favorite brushes and stick with them. It took me quite a ways into the video to decide which ones were giving me effects similar to what he created. A couple of his brushes I had, but they did not look right to me – he is using a Cintiq and I am using an older Wacom and it did seem to make a difference on how the strokes looked. I ended up creating a set of ABlaise Painting brushes to use and started by adding in just a soft round brush. He has a “go-to” brush that he always uses, but it seems too organic for me. For the actual drawing, my “go-to” brush is Grut’s I Qwillo brush – got used to it and always use it. Then for the local color and fur, a brush tip of one of Aaron’s brushes was used. Not sure which brush but it is basically a very solid color with Size 35 pixels, Opacity 100%, Opacity Pressure icon on, Flow 83% and Smoothing 10%. It was reduced down in size for the fur and and seemed to work pretty good. To get the ends pointed for the fur, the Pressure for Size was also turned on. It takes a little experimenting and several brushes were created to fit all the strokes he is teaching. He also talks a lot about values and how to light your subject – very interesting and practical since you can watch as he creates the lighting effects – the drawing sort of just pops! The last several minutes he is teaching how to finalize the image to make it look less drawn and more like an image. 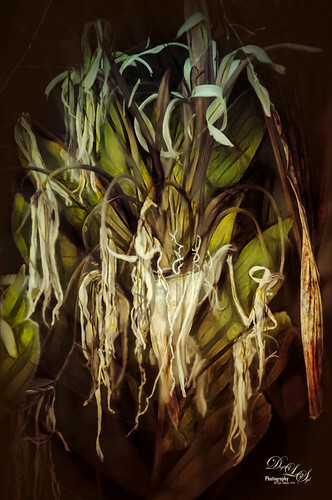 I find Topaz (for website link, see sidebar at my Tidbits Blog) Labs and/or Topaz Studio is totally in a “league of its own” when it comes to helping digital artists take their images to a new level. Even though I have blogged about Topaz plugins and most recently Studio’s AI Remix adjustment (see What is Topaz AI Remix???? ), this week I am presenting a short blog and video on how I created this image using some of the Topaz Studio’s and Lab’s plugins. The products that really are outstanding to me for creativity are: Topaz Studio AI ReMix adjustment, Topaz Studio (and previously Labs) Impression, Topaz Labs ReStyle, and, believe it or not, this wonderful little program no longer marketed called photoFXlab which uses an InstaTone program section (the 500 px and 1X.com do not work, but the other three do so it works just fine) (See my short InstaTone in photoFXlabs – Great Fun and Great Results! blog). This is not to say that many of their other plugins, like Topaz Adjust, Black & White Effects, Glow, and Texture Effects are not useful for the creative – they are great but maybe not as unique as the ones I mentioned. AI ReMix adjustment fits right into what I like about Topaz products. It has a bit of a steep learning curve to figure out what works and what does not when trying to get that creative uncanned look. That is why I decided to do this quick blog and video. The original image was beautiful and is from a group of photos at Deeezy called 20 Free Photos from Seychelles – I like to practice with some of these free images. I did not realize I would like the results but since it has an interesting artistic appearance applied, it does not matter that I did not use my own equipment for the image. Wish I had been there to do so. If you do not see the You Tube link in your browser, please open the video from within the blog. Once opened in Photoshop, the image was duplicated and taken into Topaz Studio where two adjustments were used: the Impression Adjustment (used Default settings but set it to Stroke Type 09) and AI ReMix (used my SJ Soft Painterly Effect in Preset dropdown and adjustment 0.27 opacity – the SJ Soft Painterly Effect has these settings: Opacity 0.27, Style Strength Low, Col 7/Row 3 swatch, Brightness 0.53, Contrast 1.17, Saturation 0.98, Hue 0.04, Smooth Edge 1.00 and Sharpness 0.50). Back in Photoshop, many tweaks were made since the adjustments had added a great creative starting point. I will not go through all the steps – they were quickly reviewed in the video – but it did take a bit of work to get the image to a place that worked for me. Nik Viveza 2 was used to help direct focus and there was a spotlight effect layer. John Derry’s Impasto Varnish Smooth layer style (no longer available-Kyle Webster had some also but I cannot find them either – try searching for Photoshop Impasto layer styles. Basically what is going is that a Bevel and Emboss layer style is added and the Layer Fill slider is set to 0 – preferably use a brush with some interesting edges to paint add the painterly effect on the layer). Used my SJ Pastel 3 favorite brush to paint over a few waves and rock edges to add some additional definition. Then a texture called Solstice Elan2 from French Kiss (for website link, see sidebar at my Tidbits Blog) was added – the same layer style was used on the texture set to 22% layer opacity to soften the whole foreground effect. 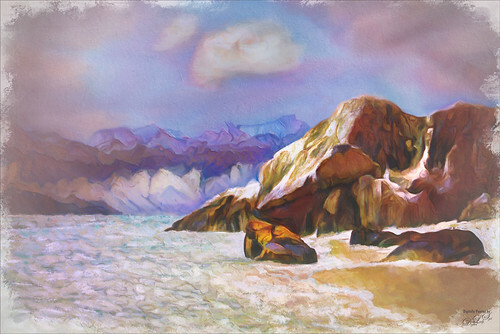 Then added a frame I created in Corel Painter was added for a final more painterly touch. Same steps were as above with the same Topaz Studio Impression and AI ReMix adjustment settings and clean up layers. To get this different effect, a stamped layer (CTRL+ALT+SHIFT+E) was taken into Topaz ReStyle and I used my SJ Tulips preset with changes to some of the sliders. This preset was created from a tulip image previously processed in ReStyle (see my How to Use a Topaz ReStyle Trick for Improving Your Image blog). You can actually get a very similar effect as the ReStyle filter gives when photoFXlab Instatone is opened and applied. Nik Viveza 2 was also used and Curves Dodge and Burn adjustment layers were also used. A little clean up and spotlight effect was applied but no impasto layer styles. One thing noticed was that by applying so much post-processing to an image that was not as high a quality as a RAW file, some artifacting became apparent. 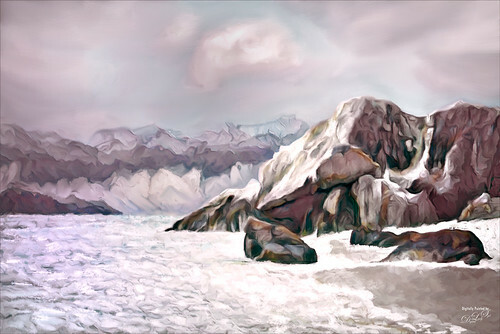 On the cooler image below, I rather meticulously painted away the artifacting in the foreground mountain and rock formations mainly using a very tiny (3-9 pixel) brush at 50% strength – this took several hours and could probably use more. On the top image, I got smarter. It occurred to me to just use the Spot Healing Brush set to: Content Aware, Multiply, and Sample All layers using a small brush around 7 pixels. Just smeared long strokes over the areas – only the white artifacting was healed (colored in), but the color in the darker areas was left alone. It took about 10 minutes instead of several hours. Wish I had thought of it earlier before hand painting and healing the first image. I am taking some time to learn a few new techniques-hence the expression in the image. I have never really explored the large digital scrapbooking community-they often use some very different ways of approaching an artistic expression. 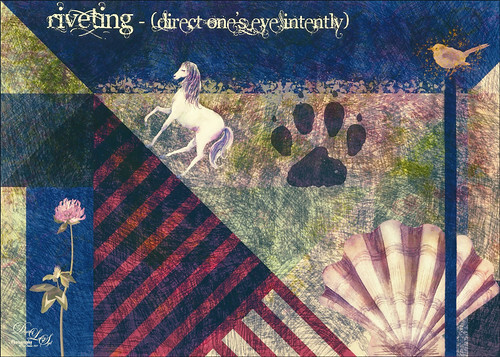 This image represents several of their techniques learned from partially from Tiffany Tilmman-Emanuel in her Mixed Media for Digital Scrapbookers videos from Creative Live. She is an excellent presenter and there are many more new things to try. I hope to be blogging on some of these soon. This was my first attempt at trying out some new techniques and it ended up being 42 layers long. 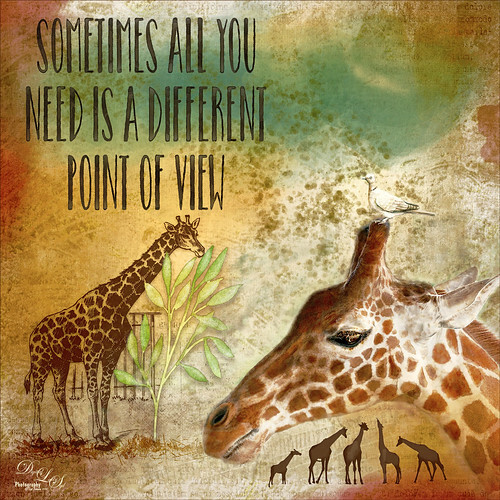 Resources used in this image are: the giraffe face is my own image, the silhouette giraffes are brushes from TutsPS, left giraffe is from Mr. Vintage Wild Animals set, white bird by Flower & Bird Watercolor by Gringoanne, and green leaves are from Lisa Glantz’s Magical Watercolor Graphics Vol1 Sample; background composed of Free Spirit su Gesso Texture (check out this free download of gesso textures – they are really nice), French Kiss Glorious Grunge Index (not sure it is still available), and Kim Klassen 2170 with Script (not sure it is still available); and the text layer is from Chris Spooner’s Watercolour Text Effect. This week just another simple technique learned mainly from Blake Rudis on how to create a pretty nice quick black and white image. 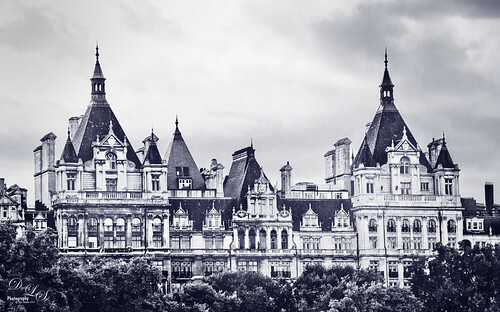 The rather low key above image is of the Royal Horseguards Hotel, also known as Whitehall, in London taken from the London Eye. I think it has a bit of a Halloween feel to it. It is a good example of using the Gradient Map Adjustment Layer to convert to a black and white photo. I am sure most of you have heard that a black and white Gradient Map will create a pretty nice black and white image without doing much else. This effect can be improved by using a couple little tricks. Blake Rudis presented the following technique in a recent Creative Live presentation called Post-Processing Workflow for Portraits and Landscapes. To get a good black and white conversion, a good color image is first needed so this is the first step for getting a good result. 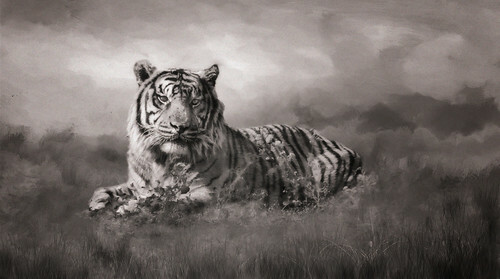 To create a black and white image, first set set swatches to the default settings of black for foreground and white for background – then clicking on the Gradient Map Adjustment Layer. Often a very nice black and white image usually occurs and many people just use this. For this image, a really almost black blue tone was used instead of the black color by editing the Gradient in the Gradient Editor (click on strip to get editor). Blake’s tip is to add a Hue/Saturation Adjustment Layer underneath the Gradient Map Adjustment Layer. By adjusting the Hue, Saturation and Lightness sliders, a better range of tones can be achieved. By clicking in the image using the Targeted Adjustment Tool in the upper left of panel, individual colors can be adjusted without changing the sliders manually. The bottom strips under the sliders are color range limiting bars (drag the outer triangles together or stretch them apart) and can be adjusted to get some more variation in tonal range. He also suggested trying a Selective Color Adjustment Layer or Black and White Adjustment Layer instead of the Hue/Saturation Adjustment Layer. I found this whole concept to be very flexible and it makes the Gradient Map Adjustment Layer a much better tool for converting to black and white. The image above got the amazing detail by using Topaz (for website see sidebar at my Tidbits Blog) Studio with the Detail plug-in. Then the Gradient Map Adjustment Layer was used for the black and white conversion, and finally a Hue/Saturation Adjustment Layer was added underneath to get the great contrast. If the Gradient Map Adjustment Layer is turned off, a really weird colorized image appears. It is amazing that this works! The last step was adding a slight color effect using the Camera Raw filter’s Split Toning settings of Highlights 194, Saturation 15, Balance -10, Shadows Hue 234, and Saturation 17 – the layer opacity was changed to 62% for the cooler tint. This week I think I am still on a Summer Brain Vacation! Decided to just play in Photoshop and figure out what to do with some of the wonderful add-ins that are available. Not sure what to call this kind of graphic art so I am making up the name “pseudo scrapbooking” – I do not consider myself a scrapbooker (many scrapbook artists do some incredible work that I have never attempted) and there are no personal images applied. I just tried to emulate a touch of this venue by applying some of these products which improved my skill set and was a lot of fun. It also gave me a chance to work on extracting objects, creating brushes for backgrounds, adding text, and creating some interesting composites. So that’s what I did this week! The above image just started as a small 7″ X 5″ document at 300 ppi. To begin, a texture brush was used to add some wirey looking lines in a turquoise color on a layer. Then a Pattern Fill Adjustment Layer using a free Square Geometric Patterns from Deeezy (these are really interesting patterns) called Square Geo 06 was selected and the layer was set to Subtract blend mode at 80% layer opacity. I also follow Design Cuts and Creative Market – see links below in paragraph. They often contain some wonderful objects that can be used in all kinds of projects and several of these items were added into this image. Creative Market offer for free a small set called Watercolor Clipart Unicorns from Corner Croft – one of the unicorns was selected and his horn removed so he looks like a regular horse. He was set on the slope of the geometric pattern. Also from Creative Market, a shell from Aloha was used and set to 89% layer opacity. The paw print was from Design Cuts Pet Shop Flyer freebies. The bird is from Nicky Laatz at Design Cuts and the pink flower clover is from Peolia at Creative Market. Many of the Creative Market sets are offered free for only for a week and then are added to larger sets. If you sign up for their newsletters, every Monday they send out these free downloads – really a good deal. Same with Deal Jumbo and Deeezy – they offer free fonts and small sets every day in their newsletters. Design Cuts usually offers their freebies on Fridays or when they do a tutorial using some of the items in the bi-weekly items sets they offer for sale (these are usually incredible deals for what they are worth). Two of Grut’s Inky Leaks brushes (these are fabulous spatter brushes) called Split Stain for the rough edging and Flick Tub around the bird. And don’t forget, each Monday Grut offers a new brush to try out for free so check it out! A Color Lookup Adjustment Layer was added using the Futuristic Bleak preset. Then a Creative Market action called Goicha from Cinematics 21 was used on the image. This contains five Adjustment Layers to adjust the color of the overall image. The font is called Angelic War. The last step was to create a stamped layer (CTRL+ALT+SHIFT+E) on top and apply Topaz (for website link, see sidebar at my Tidbits Blog) ReStyle’s Wedgewood Blue and Tan preset as is at 70% layer opacity. Hopefully you will get a chance to check into some of these resources and get some nice items for your PS practice. Here is another example of just having a great amount of fun in Photoshop! This actually started with a beautiful flower image from the Harry P Leu Botanical Gardens in Orlando, Florida. The flower was extracted using the Select and Refine command. Then I just started playing. I had no idea it would turn out being an underwater fantasy world! I like the story that the Tang and the Water Monster Flower create – and I think the shark is watching out for his Tang buddy. The background was created from five 2 Lil’ Owls (for website link, see my Tidbits Blog sidebar) Textures all placed in a group. Some solid color blue and yellow color were painted on separate layers behind the swimming fish (brushes from a small but really nice set by Richard Tilbury) and bubbles created using just a small spatter brush. The Clown Tang, Shark, and Seahorse are all from PixelSquid, one of the best sites for very realistic looking and fun objects. (See my How to Use the PixelSquid Add-on in Photoshop blog.) So this really creepy looking plant turned Water Flower Monster was created by taking my beautiful extracted flower image into the Liquify Filter and just pulling and pushing it all around. I was surprised how it turned out! I think I used every tool and it was fun to try them at different sizes on the edges. On a layer above, a sketch brush was used to enhance the lines in the flower for for a more fish-like effect. 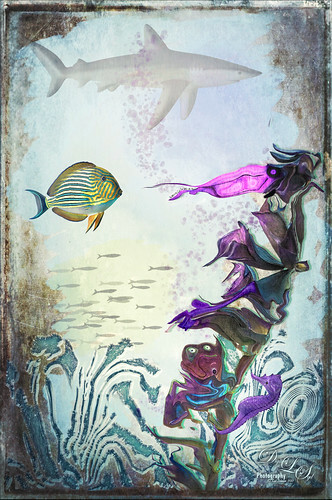 The same thing was done with the turquoise seaweed on the bottom – it was painted using Prism Light Studios Spiral Brushes-Tie Dye Brushes – Full Spider brush (was a free brush from Creative Market). Then this layer was also taken into Liquify and stretched and twisted to get this rather unique look. Several adjustment layers were added on top for contrast and color. It was just totally fun to create! This week I decided to try a little in-camera photo effect and then post-process in Photoshop. In my mind, this is the best of both worlds when trying to put an artistic feel into an image. The above was first shot with my Nikon D-300 camera (I dearly love this camera and can’t seem to part with it!) and shot the image in multiple-exposure mode using just 2 shots. I am not really sure how this type of exposure is supposed to look, but this method seems to fit floral or plant images quite well. 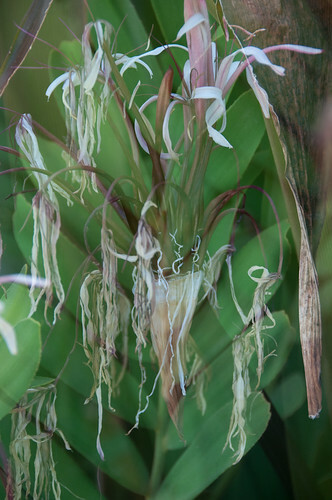 This image was taken in my front yard of a Queen Emma Lily in front of a Cardboard Palm. I see this as a very creative blend of the two exposures but it did take some finishing work in Photoshop to get the final interesting feel. So first the basic workflow for taking a multiple- or double-exposure shot will be covered. It is not that difficult but do consult your camera manual to get the exact menu settings to do this. I will be using the Nikon D-300 menus, which due to its older age, should be similar to what is available on most newer cameras. 1 First set your camera to Manual Focus. To do this on my camera, looking at the front of the camera the Focus Mode Selector dial is located to the lower right of the lens. The dial should be set to M for manual (as opposed to C for continuous auto focus or S for single auto focus). Note: For my camera, if either the Camera body or the Lens is set to Manual focus, then it must be focused manually. Many of the lenses will have a Manual focus setting also (usually the lens is set to M/A – switch to M to make it focus manually). I am using the Camera Body setting for this. 2. On the back of the camera, press the Menu button and select the Shooting Menu. Then Scroll down to the Multiple Exposure choice. Select the number of exposures to shoot – the above was just a double exposure so it was set to 2. Up to 10 are allowed. Select whether to turn on Auto Gain. The difference is that when it is on, the exposure time is divided by the number of exposures chosen for the image, and when off, each exposure is exposed for the full amount of time (meaning shutter speed). I had it turned off, but try both to see which looks best. 3. In my camera I need to turn on the Multiple Exposure setting each time an image is to be taken. It sounds a lot harder than it is. Just have to get familiar with where the settings are. Now you can try different camera settings to get different results. For the above, both of the in-camera exposures were shot using the basic Nikon 18-200 mm zoom lens set to 105 mm at F/5.6. Below is what the original out of camera image looks like. First the palm exposure was taken, then moved the camera and took the lily. Post-processing: In Lightroom a Trey Radcliff free preset called Sunday Alone Time was applied and then the Vibrance was lowered (-65) so it was not so colorful. In Photoshop the layer was duplicated and Topaz (see sidebar at my Tidbits Blog for website link) Glow was opened and my SJ Inter Web Variation was applied. (Settings are: Primary Glow Type Dark, Glow Strength 1.00, Effect Sharpness 0.12, Electrify 1.00, Simplify Details 0.06, Edge Color 0, Detail Strength 1.00, Detail Size 0.42, Brightness 0.16, Contrast 0.18, Saturation 0.08, Line Rotation 0, and Glow Spread 0; Secondary Glow Glow Type Light, Glow Strength 0, Effect Sharpness 0.54, Electrify 0.11, Simplify Details 0, Brightness 0, and Contrast 0; Color Overall Saturation to 0.62, Red Sat to 0.44, Yellow Sat to 1.00 Yellow Lightness -0.36, Green Sat 1.00 and Lightness -0.51, Aqua Lightness -0.36, Purple Sat 1.00, and Magenta Sat 1.00 and Lightness 0.50. Set to Screen blend mode at 66% Strength; and no Finishing Touches.) The Layer was set to Overlay Blend Mode at 96% layer opacity. A black layer mask (CTRL+click on layer mask icon at bottom of Layers Panel) was added and just the areas I wanted lines to show through were painted back. The Layer Style was opened (double-click on the layer) and on the Underlying Layer slide, the white tab was split (ALT+click) and set to 178/255 before exiting the menu. A stamped layer (CTRL+ALT+SHIFT+E) was created above and the now free Nik Color Efex Pro 4 was opened. Three filters were used: Midnight with no Blur added, and overall opacity of 73%; Reflector Efex set to Gold with the light coming from bottom up; and Vignette Filter using a darkish brown color and centering on the focal point. Next the also free Nik Viveza 2 (downloads with the above plug-in) was opened and just one control point was placed in the center area to add a little more structure and whitening to the focal point. Last step involved using a New Layer to clean up lines – Grut’s – MI Swish Mini Mixer brush was used to break up the edges of some lines that were too sharp – I love this brush! Check out his other brushes too – so many wonderful ones! This image turned out to be a lot of fun and created a very different type image! Another double-exposure image – used the same Nikon 18-200 mm zoom lens sets 150 mm and F/5.6. This was shot with white blinds behind the flowers in a vase and sunlight strong outside. This time for the first exposure just the focus was set to a very soft blur, then the second focused in on the flower to get this soft effect. The double-exposure created an almost translucent feel in the flower petals by shooting into the lighter background. In Lightroom just a few adjustments were made before going into Photoshop. On a duplicate layer, Topaz Lens Effects Diffusion filter was added. Then Nik Color Efex Pro 4 was opened and the Glamour Glow filter and Film Efex Vintage filter (Film Type 13) were stacked. 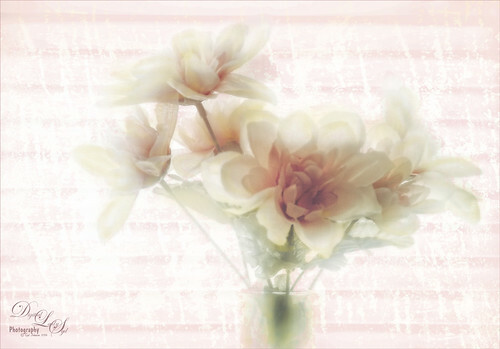 A pink pastel texture of mine was added on top and set to Darker Color blend mode with a layer opacity of 55% – a layer mask was added and the texture was gently painted off the flowers. These dandelions were shot using the same lens at 170 mm and F/5.6. Once again, the background was really defocused for the first exposure and then brought the foreground dandelions into focus for the second. My first thought was to convert this to a black and white so it was brought into Photoshop and the free Nik Silver Efex Pro 2 (downloads with the other Nik plug-ins) was opened. The Fine Art (high key, framed) preset was selected and the frame removed. Then a Finishing Adjustment using Toning 22 was used to give a warm tone to the overall image. There are lots of really great sliders in this plug-in so give them a try! It was set to 75% layer opacity and actually gives a really nice look at this point. 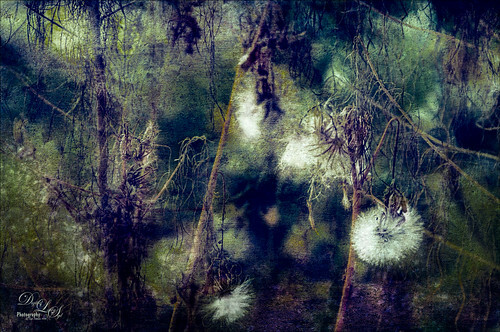 But to get an artistic feel in the image, first 2 Lil’ Owl’s (see sidebar at my Tidbits Blog for website link) Stained Plaster Collection 17 texture was added to the image and on a layer mask, the foreground dandelions were painted back without the texture. On a stamped layer, Topaz ReStyle was opened and the Brandeis Blue preset was applied. Next another 2 Lil’ Owls texture called After the Rain 14 was added and set to Multiply blend mode at 85% opacity. Another one of her textures was added called Grunge 27 and it was set to Color Dodge blend mode. This added some texture in the bottom foreground – a black layer mask was used to remove all of the texture except this area. That is what was done to get the final image. TRYING OUT THE FREE WATERCOLOR ACTION FROM ADOBE – PRETTY NICE! WHAT ABOUT THOSE COLOR STRIPS IN THE HUE/SATURATION ADJUSTMENT LAYER? WHAT IS GOING ON WITH ALL THE “AI” IN PHOTOGRAPHY SOFTWARE?